Our Pack uses "PackMaster" software to track the progress of your scout. The Den Leaders have access to the software. So make sure your child gets credit for completing activities. A report on your child's progress can be printed upon request. We also use Packmaster to purchase appropriate badges and awards. 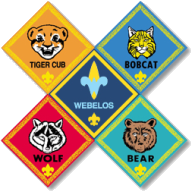 Make sure you are getting proper credit (by working with your Den Leader) and the recognition will come at each of the Pack Meetings. Packmaster will track your child's progress for as long as they are in the Pack.